It’s 2018. You can’t pretend that mobile isn’t a thing anymore. Back in 2016, the number of mobile users surpassed the number of desktop users for the first time. As of 2017, more than 3.3 billion people worldwide used a mobile device to access the internet at some point. That’s about 93 percent of all internet users. Since so many people are using their mobile devices to go online, not having a mobile content marketing strategy is tantamount to ignoring a potentially large portion of your audience base. It’s important to understand that a mobile content marketing strategy means more than having content that fits the typical screen on a mobile device. It means adapting your content to meet the wants and needs of mobile users. What Is a Mobile Content Marketing Strategy? For some, a mobile content marketing strategy is synonymous with responsive design, a type of web design that allows a site to function well and look good on a variety of screen sizes. While a responsive site can be part of a mobile content marketing strategy, it’s definitely not the entire kit and caboodle. An effective mobile content marketing strategy takes in all the ways that mobile use is different from desktop use. Shorter is often better. Think bullet points, short paragraphs, and brief, attention-grabbing headlines. Images need to load quickly and fit the screen size, otherwise people are just going to bounce. Autoplay with sound is a no-no when you’re putting mobile first. No one wants to be the person on the bus or in post office whose phone suddenly starts blasting music or talk. Mobile search is a bit different from desktop search. For one thing, many mobile users use voice search. For another, many mobile users are looking for localized content or information. One of the big reasons to put mobile first is that people are using mobile now more than ever before — even if there’s a desktop device hanging around nearby. Way back in 2013, a study from Google and Nielsen found that 77 percent of all mobile searches were conducted in an area where a desktop device was also available. The majority of people who used a mobile device even when they had a desktop available cited the ease and convenience of tapping out of a search query in a smartphone or tablet versus waiting for their computer to boot up. While more people than ever now use mobile devices when they’re online, mobile users tend to have a higher bounce rate than other users. That is because, even after years of “mobile first” advice, many mobile sites still leave a lot to be desired. They load slowly, use annoying pop-ups that cover the entire screen and are difficult to close. Some websites seem to have never gotten the memo, and don’t have responsive design or a mobile version at all, forcing mobile users to zoom in just to read a bit of text. In content marketing, one of the things you should be aiming to do is set yourself apart from the competition. If your competitors seem to have buried their heads in the sand when it comes to a mobile strategy, being the one company that offers friendly, useful, mobile-optimized content will make sure you stand out. Who Should Use a Mobile Content Marketing Strategy? In short — everyone. In the US, the average person spends about five hours a day on a mobile device. That’s plenty of time for shopping, watching videos, playing games, or browsing on social media. In many ways, creating a mobile content marketing strategy is similar to creating a general content marketing strategy. You want to have a goal for your strategy, and you want to have an idea of your audience. But in other ways, the process of putting together a mobile content marketing strategy is different. What do you want to accomplish by putting mobile first? Are you trying to drive more in-person foot traffic to a brick-and-mortar store? Do you want people to make purchases online? Are you hoping to get more people to go to your website? You might have a target audience in mind, or you might decide to tailor your content to an audience that’s already checking out your site and content on a mobile device. Analytics tools can let you see what percentage of your audience is already on mobile, and give you basic information about them. Yes, content should be responsive. But there’s more to it than that. Think of how small the mobile screen is, and how unlikely a person is going to be to scroll. Then put the most important information at the top, or the information that you think will make someone want to scroll and learn more. Use bullet points and short headlines to make your content scannable. Include images, but make sure they’re compressed and don’t take forever to load. Remember to optimize for voice and social when developing a mobile content marketing strategy. Choose keywords that a person would be more likely to use in a voice search. Make your content easy to share on social by including big social share buttons. Is your mobile strategy paying off? You’ve got to check to make sure. Measure the number of mobile visitors you get, how long they stick around and what actions they take afterward to get a sense of whether your mobile strategy is working or needs some tweaking. The great thing about using a mobile content marketing strategy is that it’s often backwards compatible with a desktop strategy. While desktop users might have slightly different goals than mobile users, they’ll appreciate fast-loading, easy-to-scan content just as much. Want to learn the ins and outs of Mobile Content Marketing? 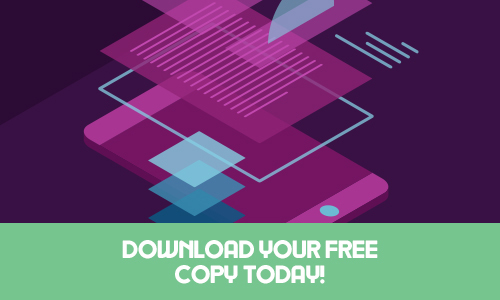 Download your free copy of the Mobile Content Marketing Guide today!